You know them, you love them, you visit them all the time. No way, baby, we ain't talking about your parents or your dealers here; we're talking about the Top 25 Must-Visit Anime Websites of 2002! Over the past three months, we here at Animefringe have been working hard to count your votes and bring you a list of the top 25 most beloved anime sites out there, and finally, our work has come to fruition. Our polls were open day and night, and we have no electoral college to spoil the taste of sweet, sweet democracy. After a one-year hiatus, the Animefringe Top 25 is back with a vengeance, and the people have spoken - so without further ado, we give you… The Top 25! Smell the sweet scent of Dragonball Z pot-pourri, with a juvenile spice. This site is unique in many ways: it is a DBZ site with an intelligent wit, well organised, nicely laid out, extensive and greatly varied with its content, but mostly in that it focusses on the children, or "brats" of the DBZ sagas. This gives the site an interesting and original view of an overdone topic online. Fan works, humor, multimedia and other general information fills the site, and a DBZ fan could spend many many hours soaking up the many scents. This site contains a stunning volume of information all about the immensely popular Ranma ½ series. If you can imagine it, this site has it: Detailed character biographies, item descriptions, location descriptions, complete manga and anime summaries, music and lyrics, computer games, a massive gallery of cover scans, a FAQ, a forum... The list goes on forever! Obviously a labour of love by a dedicated Ranma fan, this site is a model to which all anime fan sites should aspire. Everything from the site design to the detailed descriptions of every topic imaginable is complete and near to perfection. The server for this website seems to be down at the time of press for this article. Make a username and password, and then rate anime titles that you've seen before on a scale of one to ten. After you rate enough of them, it starts suggesting anime that you might like based on your ratings. Toriyama's World is not only a site for DBZ fans, but it's also for fans of shonen manga (and there is some shoujo also). With tons of fully translated manga available and even anime, this is one site that any Shonen Jump fan should have in their favorites list. For people interested in the game Go or for those looking to learn, there is a cool section devoted to the basics of the game. Forums, chat rooms, and much more await net surfers as they make a trek through Toriyama's wacky and wonderful world of manga. The server for this site appears to be in the process of moving and only the forums are up at time of press for this article. Stylish is the single word that comes to mind when looking at any of the images or wallpapers that Everything Anime has to offer. Sure there are the run of the mill images to be had, but EA keeps everything easy to access. Visitors are welcome to send in their own collections or simply browse the stuff already on the site. Tons of multimedia sections and other content make EA a great resource for all kinds of downloads. Nausicaa.net is the definitive resource for everything about the master of anime, Hayao Miyazaki. Established in 1995, this long-running site combines astoundingly complete information about Miyazaki's works with news, images and a beautifully simple and pleasing design. Beyond Miyazaki, the site also covers Studio Ghibli's other works extensively. Given that these are universally considered some of the best anime works ever made, and this is certainly the best site about them, all anime fans should definitely bookmark this one. Like a good debate? Artemis Radio is a real audio streamed talk show dedicated to the latest happenings in the world of anime. Each bi-monthly show lasts roughly 25 to 30 minutes and features the all the quarky and insightful chaos that listeners would come to expect from an AM radio station. Best of all, at press time, Artemis Radio is 94 shows strong proving so they must be doing something right. Give them a listen nighttime you're on the net. A new fan creative phenomenon is sweeping the net, and this site is surfing the crest at its forefront. Anime Music Videos (AMV) combine video from anime titles, with music from virtually any source, and creative and often very skilful editing. The result can be powerful, hilarious or moving. AnimeMusicVideos.org provides AMV editors and fans with resources including guides and tutorials, hardware and software reviews, contests and a forum, as well as a gargantuan database of AMVs. Search out your favourite anime, or view competition winners from the latest convention. One of the most popular webcomics ever, MegaTokyo is 354 comics strong and still counting. The first volume of the MegaTokyo graphic novel is available for purchase all over the web. MegaTokyo chronicles the journeys of friends Piro and Largo after a fateful plane ride to Japan, and their subsequent lives as gaijin due to a lack of money (and possibly motivation) to return home. An expansive fan site covering several popular anime series as well as some North American animation, Michael's Favorites! houses image galleries, fan art, fan fiction, downloads, links, extras, and more. Look here for goodies for Card Captor Sakura, Sailor Moon, Tenchi. Yu-Gi-Oh!, Gundam, Pokemon, Slayers, and more. If you're looking to buy any kind of anime, manga, or related collectibles on the web for a reasonable price, The Right Stuf is one of the best places to do it. They have sale prices and even "bargain bin" prices on some items, as well as their "Got Anime?" discount club membership. You can also find big industry news bytes on their front page. Always riding the latest anime trends, Pojo remains one of those must-visit sites that younger fans have to visit. They've come a long way since the glory days of Pokemon, progressing from Dragon Ball Z to Yu-Gi-Oh! and even to the broader topic of anime in general. Pojo acts as a gateway for fans to interact with one another and hopefully helps them to branch out into the broader genres out there. Think of them as a crutch that parents can trust to help their kids make educated buying decisions. Anime Academy is a nice little database of anime series, with short series summaries and rating information. The professors at the academy present the pros and cons of each series in a straightforward manner, with a nice side helping of humor thrown in for kicks. The titles in the library are sortable by name or grade, and the whole site has a "school-like" atmosphere. For years now Anime Jump has been one of the few sites daring enough to not only tell it as it is, but also prides itself on doing so. From the off-the-wall reviews of bootlegged products to in-depth looks at the latest anime DVDs, Anime Jump! has become one of those sites that readers need to check out at least once month. Also, the site has an extensive archive of content reaching back to 1998 that's as clever and witty as any of the recent articles. Comprised of a growing database of anime and manga series, AnimeNfo is the perfect resource for anyone looking for an easy way to cross-reference the series their favorite seiyuu has appeared in. With a number of different ways to browse the database, the average user can either pick a series, do a specific search, or pick a random link on one of the ever-changing sidebars and 10 ten charts on the main page. Once in a section, the user has at their finger tips a brief description of the series, character bios, and seiyuu bios all in an easy to read series of tables with icons that show what information is available. This site is a one-stop-shop for anime fans. Features include a massive forum with over 160,000 posts, a gallery with more than 2000 high quality images including lots of wallpapers, dozens of anime reviews, 11,000+ links, anime news and a very novel "journals" section for anime fans to record their daily thoughts and opinion. All these features are wrapped up in a clean, fast and absolutely gorgeous design that is both pleasing to the eye, and easy to navigate. This is a friendly anime community that any fan, new or old, can feel welcome in. If you're an avid Robotech fan, Macross World is a good resource for what kind of collectible are out there, how easy they are to find, and what you can expect to pay for them. It also houses a large selection of images of various models, both in progress and complete. Also available for Macross fans here is a lively forum community and a nice collection of more fun stuff and info on the epic series than you can shake a rubber chicken at. Offering not only regular news reports, but also market research information, a mailing list, reviews, features and contests, the Anime News Service has been going strong for over five years. They pride themselves on being market leaders, and subscribe to the philosophy of not hiding content behind fancy design. 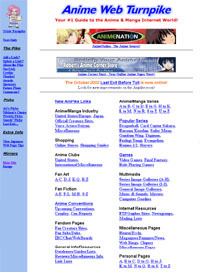 Despite the need for slightly more effective navigation, this site is a great resource for anime information. 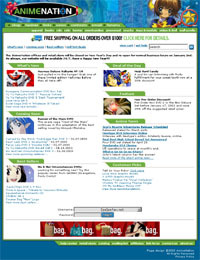 With an awesome selection of domestic and import items, AnimeNation has become one of the most trusted online retailers on the net. AnimeNation is known for its super fast turn-around on shipping and awesome packaging of items. Order from them and you'll be treated like royalty. Since AnimeNation's system even always for feedback to be sent so you can let the staff know what you thought after you receive your items. Best of all, AnimeNation isn't just a cool place to buy stuff, they are also have a thriving message board community and are an excellent source for the latest industry news. While you're there, don't forget to read the newest installment of "Ask John" and if you're brave, maybe even ask him a really tough question. The show killed Pokemon in Japan and stole countless DBZ fans with its interesting cast of characters and cleaver merchandising ploy. Yu-Gi-Oh! Dungeon offers the perfect resource for fans of the series. With links and info on all of the various video games, card games, and anime the site is the one-stop place to go for learning the ins-and-outs of this latest craze. 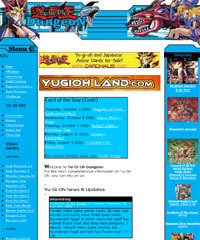 Curious to see what some of the games are about or need some help, this site is the perfect resource for all your Yugi needs. Anime Turnpike is just one of those "must-see" sites out there. Almost every dedicated fan has heard of Anipike one way or another. This site is basically a huge database of links pertaining to just about every aspect of anime, manga, and fandom that I can think of. With such a huge amount of links, one has to expect broken or old links - but even with its problems, Anime Turnpike is still the most comprehensive anime links sites that I have ever seen. Especially now that Anime Pitstop is no longer around, Anime Turnpike is THE anime search engine, and is more than able to pick up the slack. 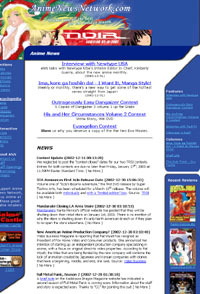 The nets undisputed source for anime news, Anime News Network has been going strong since 1998. Sitting pretty with a number of cool features and contest, readers are always in for something new and should check back at least daily. The site also features a large encyclopedia that is cross-referanced throughout the news stories on the site. If there is a word or name that you don't know, your answer can be had with just a simple click. Presenting the one and only Anime On DVD. 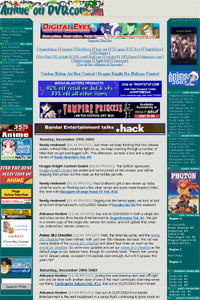 Moving up from third place to first, Anime On DVD has become the premiere web site for news and reviews on anything and everything DVD related. If there is news to tell, then Chris Beveridge and his gang are almost guaranteed to have it first. Stop by once a day and you'll always see what DVDs have been reviewed or learn what the least Easter eggs have been discovered. Plus, the forums are always boiling over with discussions guaranteed to get even the lurkers ready to spout off their opinions.